This is something we really need to know. How does GOD feel about us. I remember growing up and thinking GOD was mean and never gave me anything I wanted. Never realizing that HE will supply all of our needs. Things I wanted was not things I really needed. There’s still tons of people that don’t know how JESUS feels about them. They still get mad when they don’t get their way. They don’t understand the Love JESUS has for them. That’s our job to tell people about JESUS. See, JESUS shows us in HIS Word and in life all about GOD’S Power and HIS passion for the lost. When HE died and rose again HE was telling us that HE cares about us. I could end this sermon about how GOD feels about us with one scripture. I’ll give you the scripture. People still feel that if they mess up and do something they think will make GOD mad, that JESUS is gonna punish them. That’s the way I used to think. There’s too many people still thinking that way. We serve a GOD that was with us when we went to the bars and the drug houses and other places we shouldn’t be. HE is with us now when we do anything in our lives. We can’t hide nothing from JESUS. Wherever you are, HE is right there. We need to understand and help others understand that JESUS loves them and cares about them. HE loves and cares for everybody. That’s how GOD feels about you. That’s what we have to show to people and not just tell them about it. Showing JESUS to people is a lot more powerful than telling them. Actions do speak louder than words. But I’m also saying that telling them even after they JESUS in you is powerful. There’s a lot of people who never been to church. They don’t know JESUS. Remember back in the day when almost everyone went to church somewhere. Places were closed on Sundays. Let’s go to Luke 15 Starting at verse 1. That’s talking about one sinner coming to repentance and coming to JESUS. We should rejoice when someone comes to JESUS and repents and gets Baptized in JESUS Name and gets filled with the Holy Ghost. Today is the day of salvation. No excuses. Again it talks here about the lost being found. Please read. We were once lost but now we are found. JESUS holds us in HIS arms because HE cares for us. Don’t listen to devil and his lies. JESUS loves everybody. HE died for everybody. HE cares about us. See, this son was always there and could have enjoyed all the Blessings that were there. JESUS wants us to build that relationship with HIM and enjoy all the Blessings HE gives us and HE gives us a lot of Blessings. Are we Blessed today? You have a shepherd who lost a sheep, searched and found it. Brought it back and everyone rejoiced. The sheep can’t chose to return because it’s an ignorant animal. A woman lost a coin, searched for it, found it and rejoiced. The coin is just an object so it can’t chose anything. A dad who lost a son because of self-will. He doesn’t go searching for the boy, he stays home waiting every day to see if his son will return home. The dad didn’t looking for the boy because the boy chose to leave. 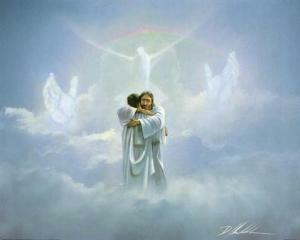 When we choose to leave JESUS even for a short period of time, HE is right there waiting for us to return to HIM. It’s our choice to leave JESUS and to return to HIM. Always remember that JESUS gives us everything we need. HE gives us breathe, life, knowledge, understanding, wisdom, food clothing, and shelter among many other things. Lots of people think they are unworthy to be loved by JESUS. That they are not good enough. We need to understand that GOD don’t make no junk. The devil lies to us and tells us we have no value. That we are no good to anyone. That we are garbage. We have a GOD that says HE is the world’s recycling plant. We have so much value to HIM that we are the reason for the cross. HE will never dump us aside. JESUS takes what the world calls trash and makes us treasures. HE makes us whole and makes us count. HE shed HIS Blood and paid the price for us to be HIS. JESUS has never, never, never, ever stopped loving us. That should make us rejoice. That’s how GOD feels about us. This is awesome! Loved reading,oh and laughed when I got to bit bout da recycling plant cuz thats where I work, praise God for cleansing by the blood of Jesus Christ of Nazareth!